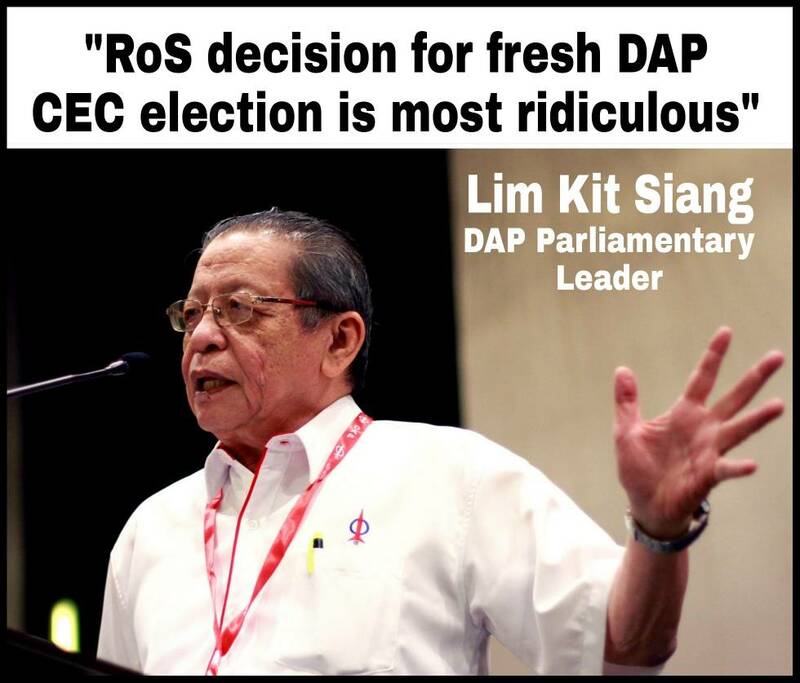 The Registrar of Societies (ROS) decision for fresh DAP Central Executive Council (CEC) election as the 2012 CEC election and the 2013 CEC re-election were not lawful and valid is most ridiculous. The DAP emergency CEC meeting tomorrow will decide on the party’s next course of action. The four to five years taken by Registrar of Societies over the issue and the long campaign of demonization with lies, fake news and false information about the DAP, the DAP CEC election in 2012 and the re-election of 2013 have allowed fake news and false information to take on the appearance of actual truth and facts. May be this is what is now popularly referred to as “post-truth” by the propagandists and purveyors of fake news and false information. In fact, it has led even independent observers to swallow hook, line and sinker to believe in these fake news and false information. For instance, one independent commentator described the whole Registrar of Societies (ROS) fiasco as “a ticking time bomb of DAP’s own design” which should have been addressed a long time ago in a transparent manner. How is the RoS fiasco “DAP’s own design”? All the tall tales that 865 DAP branches had been discriminated against and that 753 “delegates” victimized and not allowed to take part in the 2012 party elections and 2013 party re-elections were just lies, fake news and false information but they were repeatedly trotted out in the mainstream and social media as if they were gospel truth. “So, point number one: this is between DAP and its own members and has nothing to do with Umno. It was the DAP members and not Umno that lodged a complaint with the RoS. “Point number two: all that the RoS asked was for DAP to hold its party election again. And the RoS is talking about a re-election and not a new election. And there is a huge difference between a re-election and a new election. “A re-election means the same 2,576 delegates who were eligible to attend and vote in the December 2012 party election must be invited to attend the AGM. In December 2012, 753 of the 2,576 eligible delegates were not invited to the AGM, meaning they were barred from the AGM. Further to that, 547 delegates who were not eligible to attend the AGM were allowed into the hall to vote, meaning they were phantom voters or pengundi hantu. “That is all DAP needs to do. Hold the party election again. Invite the 2,576 eligible delegates to attend the meeting. Do not bar the 753 eligible candidates from attending the meeting. Do not allow the 547 phantom voters or pengundi hantu to attend the meeting and vote. The same litany of lies, fake news and false information – about the fictional 753 delegates not invited to the 2012 DAP party congress and 547 “phantom delegates” who had voted. It is now quite clear in retrospect that the press secretary to the Prime Minister, Datuk Seri Tengku Sariffuddin Tengku Ahmad had prematurely let the cat out of the bag as to what is in store for the DAP in his political exchange with DAP Director of Political Bureau and MP for Kluang, Liew Chin Tong, a week ago.